Well, I'm definitely late to the game in posting this. Or at least, I feel late to the game in posting, even though this whole challenge only came about yesterday. On Twitter (it's a whole new world on there, I tell ya), Eva mentioned that she would like someone to host a Women's Studies Challenge. Care said she thought that sounded like a good idea, I mentioned that Rosie the Riveter would be proud of all participants, and somehow the three of us ended up co-hosting this challenge. Whatever it means to host a challenge (I don't know; I never have and yet am planning on doing another one in addition to this. Go big or go home, I say), this was a huge community effort. 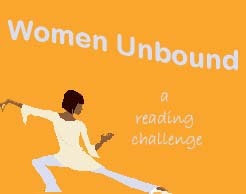 So many people contributed to making the Women Unbound challenge what it is, between coming up with the name (I had no part in that), the buttons (I had no part in that), the time frame (I had no part in that), the commitment levels (I had no part in that), the website (I had no part in that), suggested reading lists (guess what part I had in that), etc., etc. So really, everyone else did all the work and I'm just taking the credit :-) Works for me! Generally, my approach to challenges is to bite off more than I can chew and then fail miserably to meet my goals. As I am a creature of habit, I will be sticking with this somewhat misguided system and am signing up to be a Suffragette! I have so many history books on women on my shelves that it's time to get them down and get them read. I will post my reading list once I determine which of those books interest me the most at the moment, and then after posting that list, I'm sure I'll promptly lose all interest in reading any of them. But at least I'll have shown initiative! You're definitely not the last. :) I'm planning to participate but I'm not going to post about it until after the craziness of Halloween is over at our house. This was a hoot to read. and you DID do a lot just by getting the ball rolling in that comment response to Eva's first idea. :) I am so looking forward to working with you on this and getting to know you. and good idea - I think I will go look at my bookshelves to see if any of my in house books will qualify before I commit to any list. Yea Suffragettes! you gals birthed a beautiful challenge. i'm preparing my acceptance post. and btw i love your rosie posts. great idea! Yeah, I haven't signed up yet, but I am going to!